This past weekend my sister and her roommate made the trek up from NYC to visit Boston. It was so gorgeous out on Saturday. We started the day with brunch in the South End and from there walked all over the city from there to Back Bay to Beacon Hill. It was her roommate’s first time in Boston so we wanted to be sure we showed her all of our favorite spots. Seriously I think we walked six miles or something crazy though! 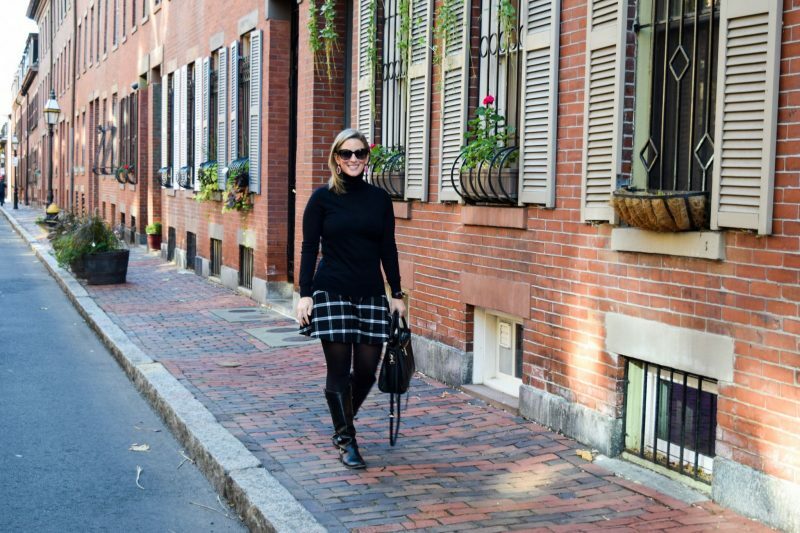 I love this plaid skirt and as I was getting ready to share this post, I realized I wore another plaid skirt around this time last year. I’ve obviously talked about my love for plaid for fall, but it can also be perfect for the holiday season. This skirt is one I would absolutely wear throughout the holiday party season whether dressed up with heels or dressed down. PS- the laughing photo above is what happens when your little sis takes your blog pics 🙂 Love ya sissy! Thanks so much Tess! Couldn’t resist adding the laughing one ;)! Hope your Thanksgiving was great as well! super cute sister photo shoot. Love those days when you realized how many miles you walked around the city! Thanks Kristen!! Hope you had a fabulous Thanksgiving too! I love your outfit!! The lipstick is such a gorgeous color too!